It’s hard not to fall head over heels for any release by Kurt Vile, no matter what he does. There’s something about his vocal delivery, and the mood he manages to establish with every tune he writes. Wakin On a Pretty Daze isn’t any different; it maximizes his chill factor, yet wraps it all in a neat auditory box for you to play over and over. Looking at the track listing, you might be overwhelmed by the length of “Wakin on a Pretty Day,” which clocks in at 9.5 minutes. 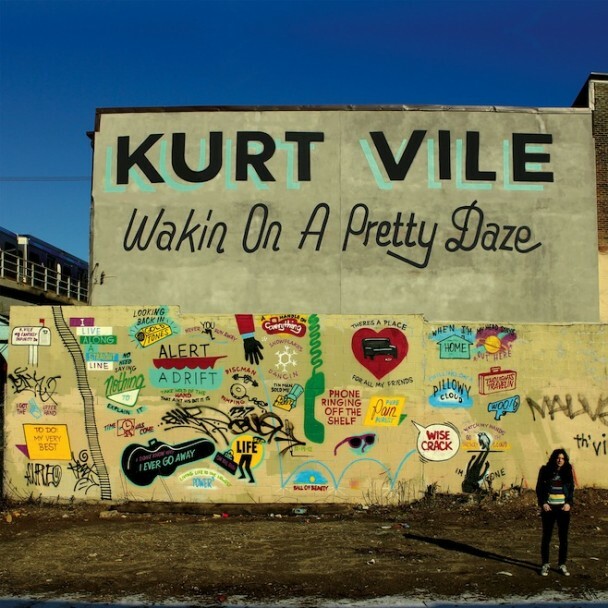 But, don’t let the number be daunting, as Kurt Vile manages to capture your attention from the get-go, carrying you with his smoky vocals for the entire duration of the track. The guitars, of course, have that swirling effect that highlights both the tone and the strumming style. Even when he tapers off toward the end with a string of “yea, yea, yeas” it’s hard not to feel the emotional pull of his songwriting. In fact, many of the songs on Wakin On a Pretty Daze are well-over the typical length one expects, like this one, but not a one of those could really be discarded. For me, the beauty in what Kurt does is not just in the lyrics or the songwriting, but in the overall mood left with the listener, myself in this case. I like the solemnity presented in a song such as “Girl Called Alex,” opening with a trickling bit of guitar before Vile makes his grand entrance. He fills some of the negative space with distorted guitar. There’s no rush in what he’s doing, always showing restraint where others might push on too quickly. That track fits perfectly back to back with “Never Run Away,” which uses a touch more pace, though the vocal delivery is what holds my interest through this track; I also appreciate the way the guitar lines work in and out of the track’s quieter moments. It’s easy to be concise in a shorter time frame. While I enjoy all of these tunes, I think he accomplishes more in the little songs here. “Shame Chamber” has a bit of a crunchy stomp to it, though lower tones of Kurt’s drawn out vocal and the cutting guitar plucking soon rid the track of that sentiment. He even flirts with this pop vocal inflection (see 1.16) that leads me to believe he’s flirting with visiting other musical territory. This number is much like the following tune, “Snowflakes Are Dancing;” that track has a nice little coat of haze and gentle tones on the vocals to accompany the natural warmth of Vile’s guitar playing. After spending hours listening to the new album, I think you’ll find it’s strength lays in the fact that the length of the songs and the emotional pull allow you to completely let yourself get lost. I imagine that’s what Kurt Vile has always been after, creating guitar pop that leads its listeners into an endless state of wonderment. Take a few trips around the block with Wakin On a Pretty Daze and you’ll surely feel the same. I can almost assuredly say that by the year’s end, everyone at the ATH offices will have admitted at one point or another that Kurt Vile‘s upcoming record, Wakin on a Pretty Daze, is one of our favorite album’s of the year. It seems outrageous, I agree, but such is the power Kurt holds over us, especially with this new single he’s just released. There’s something to his simplicity in songwriting that maximizes his emotional draw between himself and listeners. It sounds like almost anyone could write these songs, but no one could do it so effectively. The album is out on April 9th via Matador Records.